League players set a lot by their solo queue ranks. It's set something of a social hierarchy—the Challenger royalty, the titled nobility of the Masters, the knighted Diamonds, Platinum yeoman... and, of course, the massed peasantry of Bronze. The nominal meritocracy, as defined by your ability to win solo queue matches, has its flaws—never mind that the season's-end rewards are definitely one of the driving forces behind botting and elo-boosting shenanigans that regularly plagues the game, but it also sets some rather fundamentally erroneous assumptions about the skills required to reach the thin airs and heady heights of pro play. Pro players, when they can be bothered to answer, posit that a truly skilled player can carry themselves up the ranks with any champion. And this is true! At least to an extent. While being forced to play with nine other players does put an extremely large randomizing factor on a player's chances, my personal experience is that even a support player can "carry" a game with sufficient understanding of the inter-relation between runes, masteries, basic mechanics and player behavior. Even a Sona player can carry low-Elo games with good positioning and instinct for spell ranges. Especially if they grab a Sheen. And it should, by all rights, be even easier as a mid laner or AD carry, given that they have the additional flexibility of farm gold to enable them. If you're stuck in the lower ranks, chances are that your farm isn't very good, you're not careful enough to maintain vision (please, for the love of whatever deity you subscribe to, buy at least one ward on every recall), you're not packing the right runes to win trades, or you get caught because you haven't developed an instinct for spell ranges yet. Past a point, though, yes: it is definitely your champion holding you back. League's newest champion is a great case study for the differences between a pub-stomper, or a champion good for solo queue ladder-climbing, and a tournament-caliber champion. 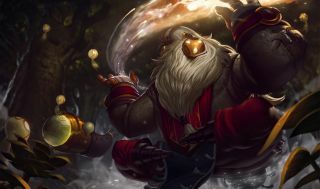 I wouldn't play Bard in solo queue—his laning is weak, his stunning skillshot has an incredibly slow missile speed, and his heals reward patience and setup rather than combat usage, making it fairly dismal for 2v2 trades. Worst of all, his Tempered Fate ultimate in solo queue's uncoordinated environment will get you yelled at by your own team for freezing them in place at inopportune moments. Some of this can be offset by customization—full AD marks lets him at least apply a bit of auto-attack pressure in lane, though it won't fully address the deficiencies in his kit and design. And yet: I think Bard has a good chance at seeing tournament play. A lot of his weaknesses can be summarized as "too dependent on teammates." Follow-ups on Tempered Fate and chases through Magical Journey, even where to put and when to use Caretaker's Shrines, are all dependent on a high level of coordination with your team—more so, at least, than what's required from stacking a bunch of AOE abilities on top of an obvious cluster of enemy players. With that follow-up, though, Bard's an amazing champion! Suddenly Udyr has a gapcloser that extends far past the immediate screen—so long as there's a wall nearby. Suddenly, Janna's Monsoon doesn't kill a fight—Tempered Fate's locked down her team, preventing escape! The increasingly common 2-man jungle strategies you see at high-tier play are further enabled, as Bard overtly benefits with xp and free mana from roaming around, picking up the chimes scattered across the map. Of course, you never see 2-man jungling in solo queue. In fact, it's vanishingly rare to see anything but the 4-year-old 1-1-1-2 top-to-bot lane compositional standard even in Team Builder queue, even as it's been proven over and over that a good roaming or laneswap strategy can utterly kill an enemy champion's scaling. Of course, the trick is to pull off a good laneswap, and that is exactly where solo queue falls short. Bard's (potentially) strong in a team environment, but solo queue is all about the individual skill...kind of. You would think that a burst assassin like LeBlanc would be a normal (and possibly frustrating) part of the solo queue experience right now. We know, from LCS games and elsewhere, exactly what she's capable of in equally capable hands: almost single-handedly devastating teams and taking turrets. Yet, for all of her demonstrated prowess, her solo queue win rate is a relatively abysmal 47%, or statistically more of a hindrance than help. Have pro players deceived us? Is she actually a bad champion? Patently ridiculous, as anybody that's had the displeasure of going up against a decent LeBlanc knows. But between her slow chains and squishy defenses, she's a very temperamental champion. Unless you know exactly what you're doing and how you plan to get out from moment to moment, you'll likely find yourself at the wrong end of a stun or bind—and subsequently wrecked. A good player can get incredible mileage out of a champion with a high skill ceiling. The Faker vs Ryu Zed-on-Zed showdown in the summer of 2013 stands as proof that the game has ridiculous mechanical depth to it, under the right circumstances. Even milliseconds may be taking too long to respond to a world class player's course of action. But a player trying to get good might not benefit so much from that ceiling—actually, they should be more worried about meeting the requisites of a champion's skill floor. The skill floor is, simply, that bare minimum of competence you need to make a champion worth playing. A champion like Sona, for instance, has an almost depressingly low skill floor—stick close to an allied champion, press buttons, and you're playing her well! Or well enough, at any rate. Sure, you miss out on well-timed Power Chord usage or a good flash-Crescendo, but they aren't absolutely vital to making her a useful teammate. Champions heavy on the AOE usage or otherwise commanding self-targeting spells instead of skillshots tend to be very newbie-friendly as a result—and, consequentially, much easier to grind ladder points with. Do they also tend to suffer against a high-ceiling champion? Sure. The way the game's designed, high-ceiling champions tend to be packed with a lot more power, at least in the form of tactical flexibility. What makes LeBlanc terrifying isn't entirely the damage output at her disposal, but a significant part of it built inherently into her extreme mobility. Anybody foolish enough to attempt a Sona mid lane into LeBlanc, for instance, would probably do less damage to their team's odds by sitting at fountain and walking away from their keyboard—with only Flash as an escape from LeBlanc's kill pressure, any ill-conceived attempt to play Sona as a mage inevitably ends up with her doing a pinata impression. But does the same hold true for the increasingly popular Diana mid? Definitely not—and though Diana isn't quite as easy as Sona, her targeted Lunar Rush and Pale Cascade shield offers her both more survivability and guaranteed damage than LeBlanc. Or Ziggs, who benefits greatly from the recently upgraded mana regeneration for Athene's Unholy Grail—there's very little for LeBlanc to do against a kit built around easy waveclearing and lane pressure. She can't even roam properly, thanks to Mega Inferno Bomb's ludicrous range. Even outside the mid lane, the difference between skill ceiling and skill floor holds true. Caitlyn's free Elo for most people, especially compared to Ezreal—her longer range, reliable escapes, and easy waveclearing makes her much easier to lane with than Ezreal's single-target-centric kit. And in the jungle, nobody's picking Sejuani over Lee Sin because of her greater mechanical potential—more like it takes a heck of a lot less effort to turn her into an unkillable perma-slowing tank. Who needs to InSec their way into a fight if you can just run them over headlong with a giant pig? There is definitely such thing as "Elo hell." There is definitely such thing as the unwinnable game. There are definitely some champions that counter others, thanks to the interplay between their kits. But what a lot of players fail to ask is whether or not they've contributed to their own torment. Did you pick Draven, a short-ranged high-complexity AD carry, into Caitlyn—who's exactly the opposite? You didn't just inconvenience yourself—you not only indirectly fed Caitlyn a lot of gold, but made it so that the enemy jungler can focus their attention on other lanes, making it harder for your teammates too. Picked Zed mid, and your entire team does only physical damage? The other team thanks you for all of the Randuin's Omens and Thornmails they're gonna stock up on, neutralizing damage from your side across the board. There is an elusive happy medium to find in solo queue: a compromise between selfish play and team synergy, between ease of use and high potential. It isn't entirely about how godlike you can play Riven top lane—if you play with that kind of self-centered mechanics-only mindset, you'll only get partial credit in solo queue's skills test. True mastery—and a fancy precious metals border—comes from understanding the game as a whole.